Enjoy drinks and canapés as the sun sets over the magnificent Pyramids. Fly to Luxor and relax in the beautiful gardens of your hotel, your Special Stay for tonight. Discover the antiquities housed in the Luxor Museum followed by a walk through the colourful local markets. Raise your glass and toast the start of your Nile cruise with drinks and canapés. Today travel to Dendera. Marvel at the vibrant colours of the hieroglyphics adorning the roof of Hathor’s temple before returning to Luxor and visiting the impressive Luxor temple. This evening’s entertainment will delight with the colours of the whirling dervishes and the mesmerising moves of a Nubian dancing performance. Cruise south to reach charming Aswan, the home of the Nubian people. Discover the Osiris temple complex of Philae, then visit the stone quarries to learn about ancient carving techniques and see the enormous unfinished obelisk. A leisurely afternoon awaits as you savour your last moments on board and take a felucca cruise on the Nile. Tonight join the Captain and crew for a farewell Gala Dinner. Visit a traditional Nubian village or take a motorboat to the upper reaches of the Nile. Alternatively, discover the vibrant botanical gardens. Fly to Abu Simbel and visit one of Egypt’s most magnificent monuments, the enormous World Heritage-listed temples of Ramses II and his wife Nefertari, rescued from the rising waters of the Aswan Dam. Later, fly to bustling Cairo for your two night stay. Discover Islamic Cairo or explore Old Cairo. Alternatively, visit the ancient site of Saqqara. This evening join your Tour Director for a farewell dinner. Say farewell as you transfer to Cairo airport. Witness the ancient wonders of Egypt & Jordan on a 20 day tour. 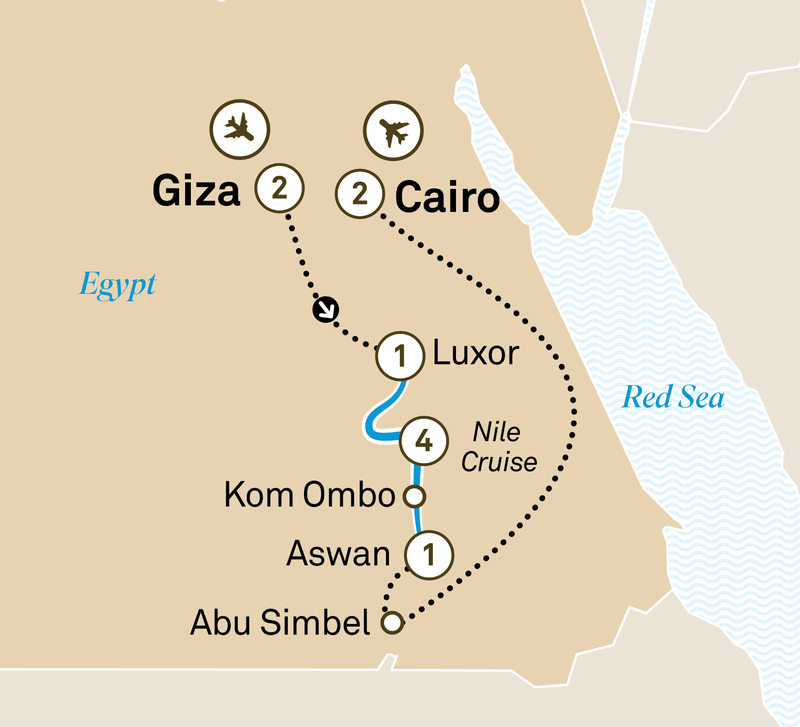 Glide along the Nile on a luxury cruise to Aswan, visit the Valley of the Kings & Petra.